I seem to be running behind on everything this week and simply have no excuse for it. But, I do have a new piece of jewelry to share with you. It's for Sj Designs' Honey Do List. Each month Sarajo's husband presents her with a design inspiration, and she extends that inspiration as a challenge for other designsers. I could not resist this month's picture. It's pure, rusty heaven! In addtion to the rusty hues, I spy black and white as well. But, it's the rust that really stands out. I started my work on this challenge by selecting my rusty component. I've got plenty to choose from, as I am a collector. However, I remembered that I had just bought a selection of keys at a craft and thrift show. There was a massive bin of them that I dug though, selcting just the ones I wanted. Of course, I snagged a few nice rusty ones. 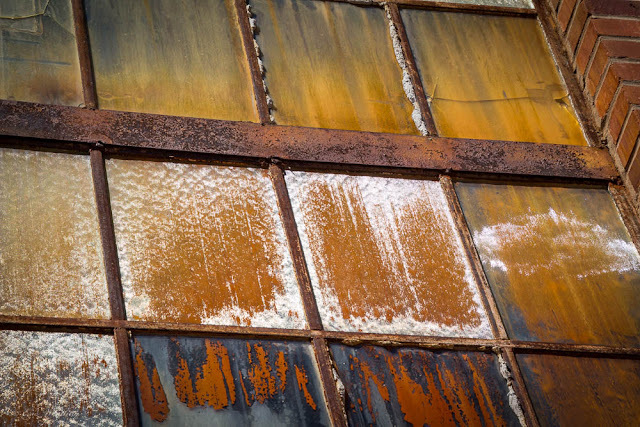 This one was not only rusty, but also had a nice square-ish shape at the top, reflecting the shape of the window panes in the picture. I have to admit, that it looked more rusty originally. I decided to coat it with Renaissance Wax to seal in all the rusty goodness. Alas, it dulled and darkened the patina rather than lifting it up. 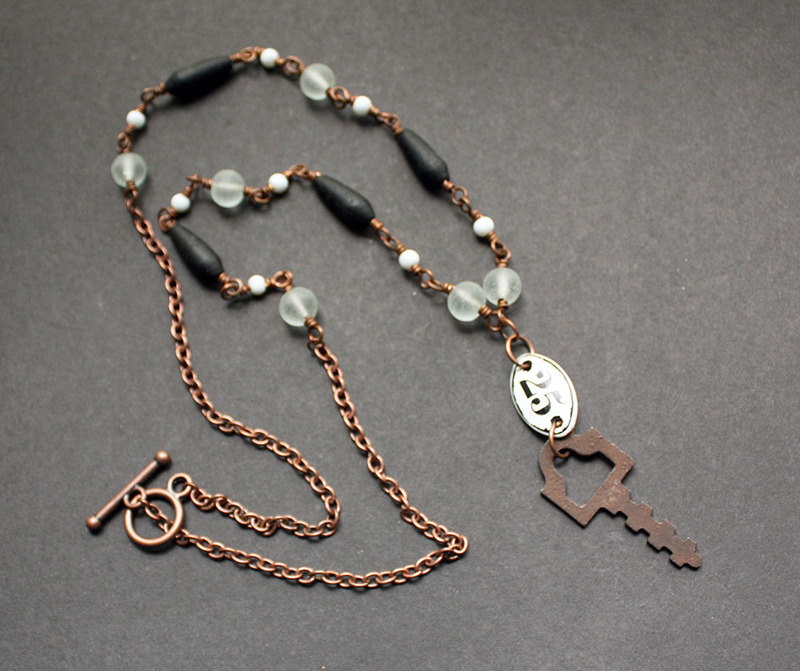 Here's another key from the batch that still has that orange glow to it. I suppose I could have selected another key, but I was determined not to be deterred. 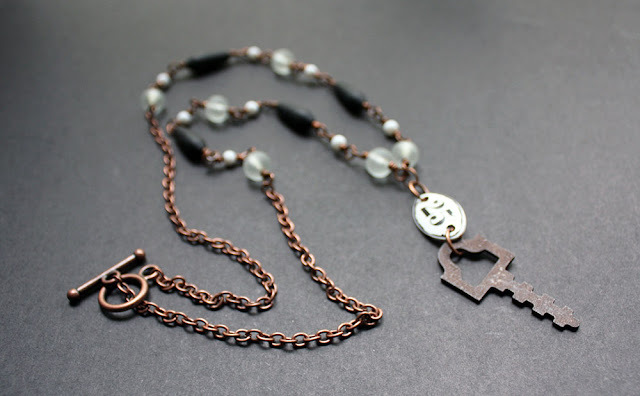 Since the orange glow had been subdued, I decided to use antiqued copper to bring it back into the necklace. 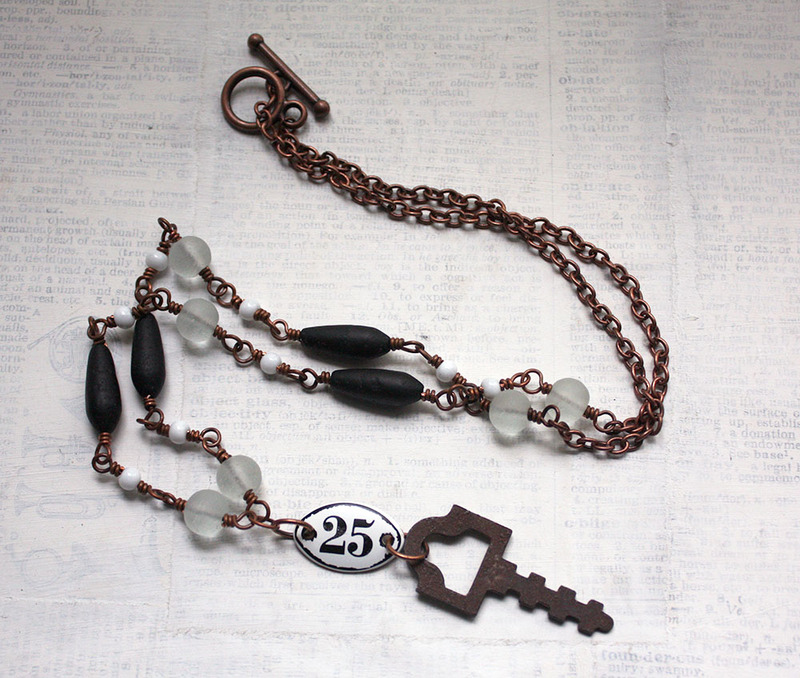 The key was attached to a scrapbook element with "25" written on it. (I did have to alter the silvertone back with Vintaj Patinas to make it match a litte better.) There's something somewhat industrial about the charm - much like I imagine the building the window can be found on. I made the chain of the necklace with cultured sea glass in clear and black, ensuring that they weren't too shiny for the rustic-ness of this inspiration. In addition, small white glass beads were included. The beaded portion makes up the front of the chain while simple antiqued copper chain and a toggle clasp complete it. At first glance, it may be hard to see that this necklace came from the inspiration photo, but each and every selection for it came directly from that fabulous image. I can't wait to see what the inspiration is for next month! Make sure you hop on over to the Sj Designs Jewelry Blog to see what else that picture inspired. Rusty is right up your alley! You always come up with designs that perfectly fit the vintage aged look! Not a single elements outside the theme and the #25 tag is a great find! Beautifully done Hope. You had a great inspiration photo there to start with. I love rust! 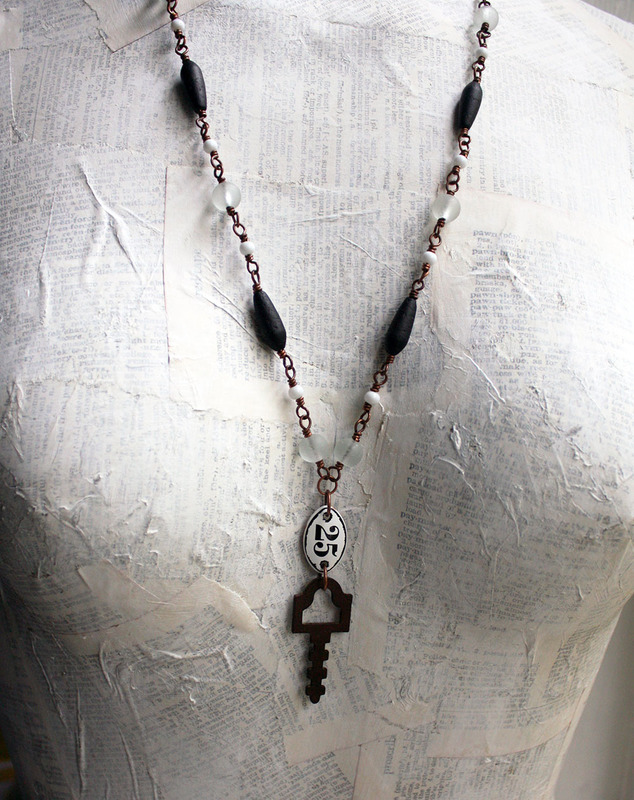 I think the key look great but I know how you feel when sealants change the tone too much. That drives me crazy when I am trying to maintain a patina. 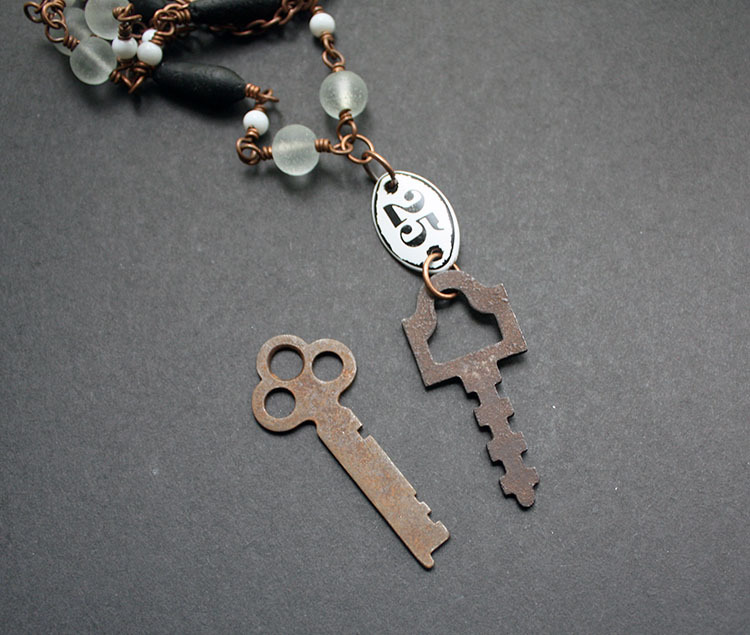 Love me some rusty jewelry and keys! I like the look of this one...vintage looking and cool. Eric, I just hope I did your fantastic inspiration photo justice. You have a great eye and captured that so well. Thank you for your kind words! Here is a story for your Necklace, Hope. "It is a apocalyptic steampunk world. The windows of the No. 25, abandoned glass factory of the Victorian period seems to glow from within. For this is where the members of a secret beading society meet to bead codes in silence. Once initiated into the society each beader is given a special key that they must wear on their person at all time..."
I love this necklace, Hope! You really did find the perfect rusty key... and I have to thank you for reminding me of the stash of keys I got from a friend a few months ago. I cleaned up, i.e. shoved a bunch of things in cupboards, and forgot about them! You pulled together a great collection of elements for your necklace... I especially love the touch of the scrapbooking element adds. Thanks for playing along with us this month! I'm glad Eric's photo inspired you. Check back on April 2nd to see what Eric has in store for next month! Sarajo, Thanks you so much for all your kind words and the amazing inspiration. I'm glad it made you remember your keys! I definitely have a key obsession. But, I think they work so well in jewelry. I can't wait to see what you create with yours. And, I'm looking forward to Eric's next challenge! !